This foreign inheritance seminar was well-attended; there were close to 50 attendees. The majority of the attendees were business and estate planning lawyers; there were also a few immigration lawyers. 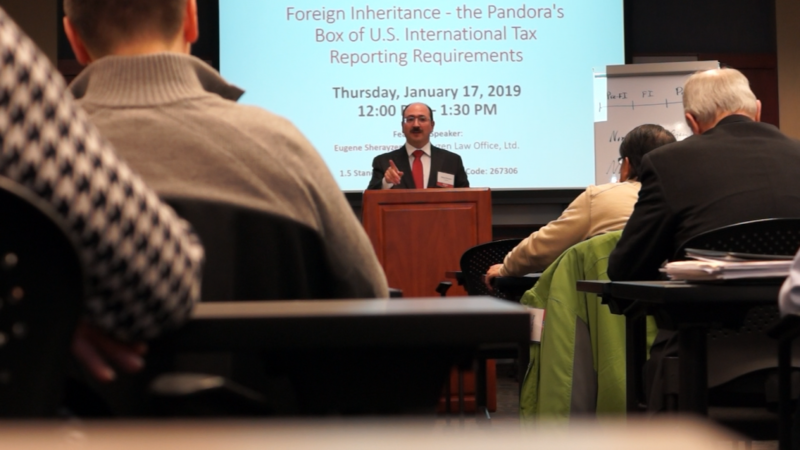 Mr. Sherayzen defined the main goal of the seminar as broadening the awareness of the U.S. international tax implications of receiving a foreign inheritance. He first focused on the definition of the concept of “foreign inheritance”, exposing the complexity behind this term. Mr. Sherayzen further explained how this term is defined for income tax versus estate tax purposes. He concluded this first part of the seminar by going over a set of hypothetical situations and explaining the U.S. tax consequences the foreign inheritance definition would have in each of them. During the second part of the seminar, Mr. Sherayzen explained the reporting requirements associated with foreign inheritance. He also explained the difference between the taxability of a foreign inheritance and the reporting of a foreign inheritance. A foreign inheritance may still be required to be reported to the IRS even if it is not taxable. Mr. Sherayzen devoted the third part of the foreign inheritance seminar to pre-inheritance transfers of assets by a foreign decedent. He explained how an international tax attorney has to analyze each of these transfers in the context of three main strategic issues: classification, income recognition and information reporting. The attorney then focused on the example that embodied all three of these issues – the usufruct. During the final part of the seminar, Mr. Sherayzen focused on the post-inheritance U.S. tax compliance issues. The attorney described, in a broad manner, the income tax and information tax reporting requirements associated with various classes of assets. Additionally, Mr. Sherayzen separately discussed the concept of a foreign trust, stated its main reporting requirements and introduced the complications concerning the foreign trust income tax recognition. If you are about to receive or already received a foreign inheritance, you should contact Sherayzen Law Office for professional help. We are a team of tax professionals highly experienced in U.S. international tax reporting of a foreign inheritance as well as offshore voluntary disclosures which involve inherited foreign assets. We have helped hundreds of U.S. taxpayers with their IRS foreign inheritance issues; and We can help You!